Lifeguard certification provides lifeguard participants with the knowledge and skills to prevent, recognize and respond to aquatic emergencies and to provide care for breathing and cardiac emergencies, injuries and sudden illnesses until emergency medical services (EMS) personnel take over. 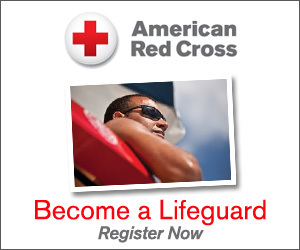 Lifeguard Recerification Review provides currently certified lifeguards the opportunity to review the Red Cross Lifeguard course materials/skills and renew their certification. Shallow Water Lifeguard certification teaches lifeguard participants the knowledge and skills needed to prevent, recognize and respond to aquatic emergencies in shallow water up to 5 feet deep. Waterfront Lifeguard certification teaches lifeguards the skills and knowledge needed to prevent and respond to emergencies in nonsurf, open-water areas found at public parks, resorts, summer camps and campgrounds. Water Safety Instructor (WSI) is the Red Cross designation for a certified swimming instructor. The WSI course trains instructor candidates to teach courses and presentations in the Red Cross Swimming and Water Safety program including Parent and Child Aquatics, Preschool Aquatics, Learn-to-Swim, three adult-focused courses as well as the Basic Water Rescue and Personal Water Safety courses and more. Certifications Issued: Red Cross Water Safety Instructor (WSI) certificate valid for 2 years and Fundamentals of Instructor Training (FIT).